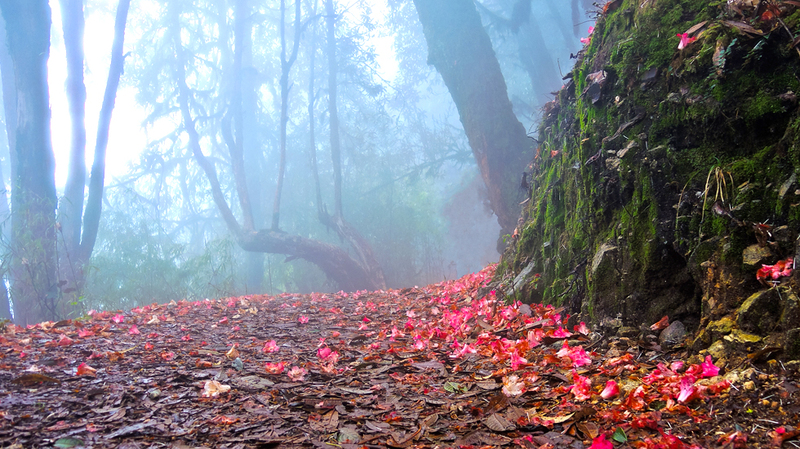 Another pristine natural splendour destination is Barsey situated at an altitude of Barsey 10,003 ft. Barsey Rhododendron sanctuary covers an area of 104 square km laid alongside Singalila range. First reach Hilley via Jorethang and Somabarey. From Hilley situated at an altitude of 9,000 ft is one of the entry points of this sanctuary. From here it is a 4 km non sweat trek through dense Rhododendron forest towards Barsey. To witness the wonderful array of flora and fauna ideal time to visit Barsey is during April and May, when blooming Rhododendron ablaze the hill with vibrant colours. Apart from Rhododendron Hemlocks, Silver Firs, Magnolias are the important flora of this sanctuary. Among fauna Barsey Rhododendron sanctuary is home for Red Pandas and Black Bears. While trekking glimpses of Kanchenjungha will inspire your walk. Once you reach your destination smiling snow-clad peaks under the turquoise sky will welcome you on a clear day. Stroll around the sanctuary to get a better feeling of Mother Nature. There is a covered watch point near the centre beside a small water body, where wildlife comes for drinking. If you want the thrill of watching them at night stay locked inside for a night. There are couple of private resorts for night stay at Barsey. Barsey can be approached from Bermiok, Uttarey via Dentam as well.